I had a few questions on my Focusing on the Inside Ski post, so here is some help with visuals for the topics covered there. I found some awesome frames of one of Ted's turns, where all the elements of the inside ski discussion are quite obvious. snow spray: the more spray the more pressure on a ski. This also indicates if the pressure is on the tails or front of the ski. Even a purely carving ski will spray some of the displaced snow. So, without further ado, here are the photos (credit goes to Ron LeMaster for creating them). And here is what i see there... looking at the individual frames in sequence. Pushing off the inside leg? Slight pressure on the old inside ski in frame 1 going to zero in frames 2-3. No inside leg push whatsoever then: there is no extension off it, it just maintains contact with the snow as the hips rise in the toilette seat position for transition. Pressure as in snow spray on the old outside leg at zero in 3 indicates outside leg flexion (or outright retraction). In 3 he is floating, i.e. no weight to speak of on either ski. The release then is realized via flexion/retraction of the old outside leg. He is absorbing the massive "pop" from the previous turn and use it only to float the skis over to the other side. The old outside knee - look at how much it came up from 1 to 3, that is some serious untipping, i.e. un-edging, certainly not ignored. Is he tipping that first ? It looks that way, looking at the way the knees move, but certainly not after the other one. As he flexes the outside leg, he is tipping that ski off the edge. From 5-11 strong tipping of the new inside ski, the old outside ski. I don't see any indication of lazy tipping of the new inside ski - that would create a visible A-frame? Frames 6-8: snow spray from the little toe edge of new inside ski, indicating strong tipping and hinging off that edge. As you tip it, it tends to do just that. Perfect argument here. He does not seem to be sliding, as he's staying close to the blue line on his left. Hinging - perhaps not explained in my previous post, as you tip the inside ski while in contact with the snow, it feels like the ski is hinging off the little toe edge. 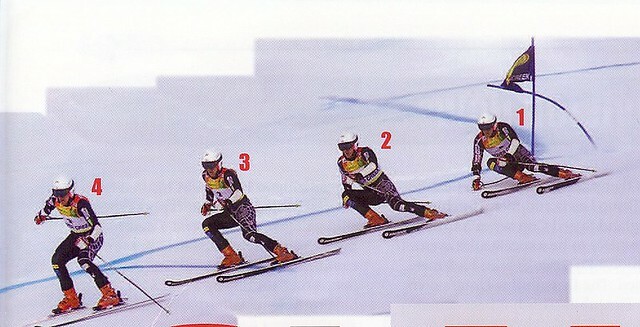 Until frame 9, there is little pressure on the outside ski, he is travelling straight with the ski not bent... He is just tipping and hinging the inside ski only. It is possible he is skidding the outside ski, adjusting the turn shape at this point - that would explain why we can't see the blue dye above him. 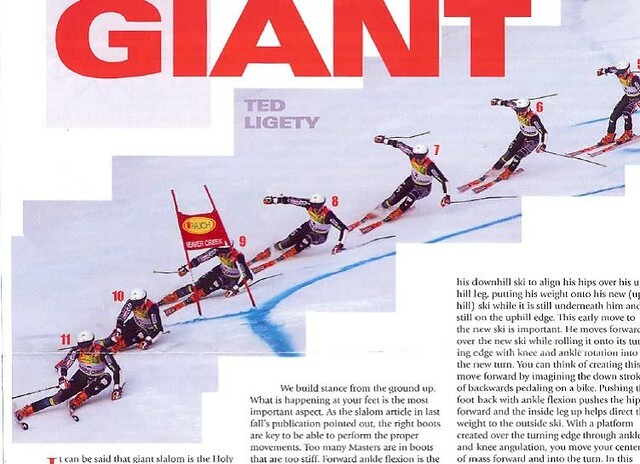 Look at the bend in the outside ski in frame 11... that is a 30-35m radius ski but looks bent as much as in a short slalom turn... his inside ski is very light on the snow, comparatively there is no bend in that ski - is your inside ski so light at that point in the turn? Shuffling the inside ski forward? Not one bit! This is probably the most obvious element of his technique here... and an important one at that. Look very hard at slide 4. How far back is his new inside ski in transition. Look at 5 and 6 - see how far back it sill is. Now look up on the hill at a few skiers and you will most likely notice the skis already shuffled at this point. By the way, slides 5-6... where is the fabled wide stance? From a tactics standpoint, I see a slight compression in the first turn, as the slope seems to level off and he is strong and stacked on the outside ski to bend the ski. In the second turn, I see a fall-away: the slope increases and in essence falls away from his direction of travel - he is just the opposite of the first turn: strongly angulated over the outside ski, to make it stick! He angulates early, with the hips on the snow, in anticipation of the fall-away exit... remember: When the going gets tough, the tough get on the outside ski. Viewed 2166 times ( | Print ) this page. The Ted photo montage is by Ron LeMaster as per photo credits in his book Ultimate Skiing for which this montage is the front cover.